Art Preston’s post concerning “The Grading Conundrum” once again raises the debate of how we measure and assess our school students. South African schools have been through a whirlwind of change, re-change, and - sadly- un-change in the last two decades. It is clear to me that teachers, our nation’s most endangered resource, are disillusioned and fatigued. This instability of assessment standards has lead to a gross instability in the quality and manner of teaching across the country. The complete lack of consensus on assessment standards and methods is clear to us every day at staffroom. Every new school we sign-up has a different approach, and our system has become very good at being flexible to their needs. These staffroom schools are some of the best in the country. If they can’t reach consensus on how to assess, who can? In thinking about assessment there are, of course, two extremes - a heavily quantitative method resulting in a percentage rating per student, and a heavily qualitative approach whereby students are assessed on competence and demonstrated ability. As a Computer Scientist, I do value the quantitative aspects of data. When I taught IT to High Schoolers - my fancy Excel spreadsheet (later, staffroom) calculated their overall average percentage for that course. It was trivial to bin my class into percentile brackets and understand how I was doing in terms of the expected bell curve. But for many parents, the typical “59% for Mathematics, 61% for English, etc.” report leaves them wondering what they are doing wrong with their child. Many students will tell you: “I’m really good at Algebra, but I just can’t do Geometry. So I got 80% for Algebra, but only 39% for Geometry. That’s why I only got 59%.” That 59% for Mathematics tells the parent nothing about their child’s particular strengths and weaknesses in the subject. And, no, mapping a 1 to 7 code/level scale to these percentages instead of A+ to F- does not help. 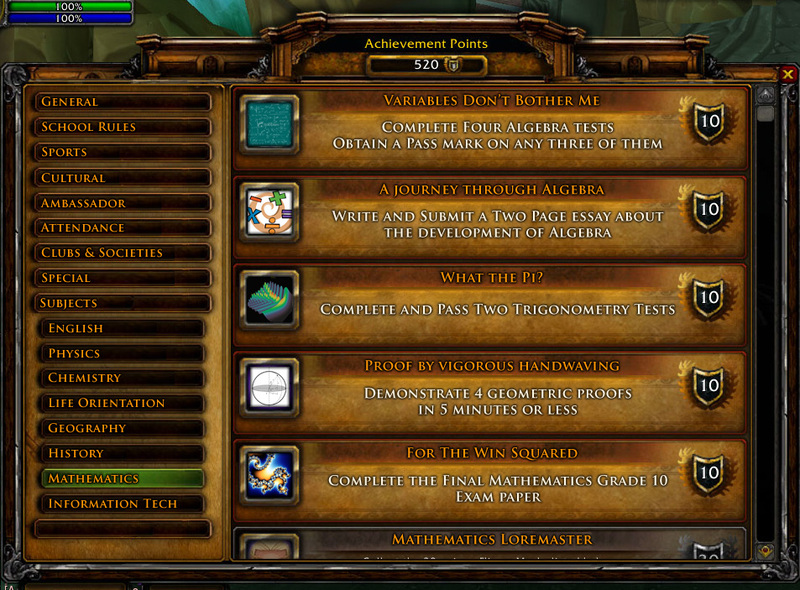 If World of Warcraft has taught me anything, its that kids (okay, and adults) crave achievement. There’s nothing better than finishing a dungeon and seeing that golden achievement pop-up on your, and your guild’s, screen congratulating you on the effort. You carry that achievement with you for the rest of your character’s existence in the game. If students were as motivated to achieve in school, as they are in Warcraft, they would do a whole lot better. And, again, no - the current farce that is annual school prize-giving (in which everyone gets a certificate regardless of effort) is not sufficient. I believe Achievements must be rewarded immediately. In the age of transparency, students and parents want measurable data and facts. They want to see their current status, and see simple step-by-step action plans to success. Schools seem to be in the business of helping students to unlearn what they pick up in the real world of cell phones, games and facebook. What if, rather, our schools unlearned their 19th century habits, and relearned what 21st century students need to get out of the education process. Let’s embrace our students’ world. In the 21st century, education is about project-based learning, connections with peers around the world, service learning, independent research, design and creativity, and, more than anything else, critical thinking and challenges to old assumptions.